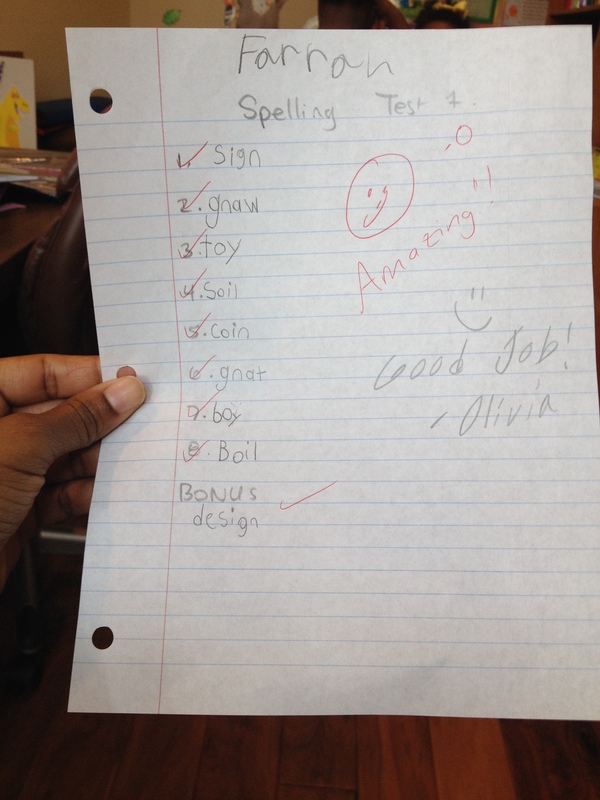 The 6-year-old made a perfect score on her first spelling test, but that’s not the point of this post. Check out the picture. After I graded the test and wrote my comments (in red), big sister, Olivia, decided she was so proud of Farrah that she wanted to leave a comment too. She wrote “Good Job” and drew a smiley face. Farrah beamed from ear to ear to see these comments, and I’m thinking WHY NOT make a big deal when they get a perfect score on a test or paper? Yes, if little / big sister wants to write a comment, that’s just fine, but I’m thinking more in terms of both Mom AND Dad. Instead of the girls just seeing my comments on an assignment that I return to them, how cool would it be for them to see a positive comment from both me AND Ray? Or even from another adult who happens to be around (their God parents, a family friend, etc.) Positive reinforcement can make a big difference in performance. Likewise, if they turn in work that really needs improvement, I think both Ray AND I (but no others) should put our brief comments on the paper, even if he’s not the one involved in teaching the subject. It shows that that he does know and is highly interested in what they’re doing during our school time. Side note: I’m proud of Farrah that her handwriting has improved. She has had the ability to write neatly for quite a while, but she rarely takes the time. See her name at the top? She scribbled that quickly before turning in her test, and that’s her typical sloppy handwriting that I’ve been trying to break her out of. But the rest of the penmanship on the test is not bad.